My previous post reminded me of a poem I'd written early in my twenties. What great days, hanging out with Scott & Zelda! No, I'm not that old. Nor am I as old as "Music Lessons" makes me seem. As I typed the poem into my post, I thought about revising it. After all, rather than rock history, "Music Lessons" is more about getting laid, a recurrent theme in my youth. However, having read Wordsworth's Preludes, I fought the urge--er, to revise. Well, mostly. I changed some line lengths because I hoped to limit how often screen resolution forced line breaks. Otherwise, "Music Lessons" appears below, with all its pimply angst, as it originally did in G.W. Review & later in One Shot. I were reading a stroke book about intelligence. The garden hose. No, not soap. Radio. My shirt had opened & breathed. Turtles! I shouted. Hollies! Butterfly! Jerry Lee Lewis! Elvis Presley! The Monkees! Your mouth to mine & bam! Bill Haley & the Comets! R U Ready 2 Rock? 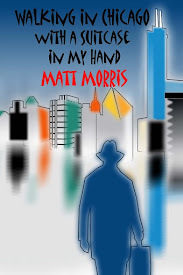 Pudding House Publications, with no association whatsoever with K-tel International, proudly presents Matt Morris: Greatest Hits 1982-2009. Twelve creative hits! Three decadent decades! One original artist! Feel the power of "Aspects of Dagwood," "Spirit of the Dead Watching," "Ars Poetica," "Night at the Improv, C. 1600," "Life of God," "Road Service" & many, many more. Yes, there's magic in the music. The Hives. Polysics. The Flaming Lips. White Stripes. 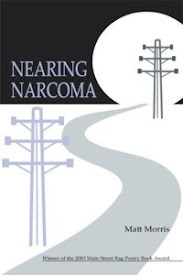 Plus, if you order now, you'll receive--at no extra charge--the never before published in any book, "Scenes from a Sonata." Rush delivery available! Get yours today! Andy has a lot of CDs--more than anyone I know, myself included--with everything from classical to classic rock, from blues to bluegrass, from soundtracks to sound-effects, from mainstream to alternative, from retro to progressive jazz. I know where he keeps them, too, if you're interested. Perhaps the only thing Andy has more of than CDs is time. So every year, Andy pours his considerable resources & energy--albeit considerably less considerable--into the creation of elaborate mixes of music developed around a theme. This year, Andy chose a song about each state, an arduous task to say the least. I can't imagine the amount of time--time he could have spent, say, reading comic books or perhaps taking quizzes on Facebook about comic books--he invested in this project. 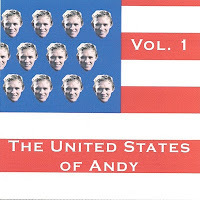 The first volume begins with John (They Might Be Giants) Linnell's "The Songs of the 50 States," a fitting declaration of Andy's purpose. The next tune, "Everyone Loves Delaware" by Pookey Bleum, seems a bit sarcastic when coupled with Linnell's tongue-in-cheek introduction, for the listener may be misled initially about the quality of the songs to follow. However, this is not simply a silly collection of novelty songs, but a fairly eclectic selection of songs, mostly out of the mainstream, representing a wide array of emotions, ideas & musical styles. To be fair, I have no idea how difficult it was to find songs about Delaware. Maybe this is "the" song. Indeed, it would be easy to quibble about some of Andy's picks--"Georgia Hard" is too countrified for my tastes--but this collection hits the mark with nearly every song. Some of my personal favorites include Sonic Youth's "New Hampshire," Joe West's "South Dakota Hairdo" & Brian Borcherdt's "New Mexico." In fact, since Andy gave me these CDs last month, they're the only music in my car. I keep them on a constant three disc rotation. If we recall Sir Philip Sidney said the purpose of poetry is to instruct & delight, then Andy's latest, greatest mix is, in a convoluted sense, poetry. For not only are the songs enjoyable, but Andy showed the foresight to arrange the selections in the order that each state gained admission into the union. "That's educational!" as Black Francis would tell you. Well, he would have if the Pixies' "UMass" were included in this collection--which inexplicably it isn't. Nevertheless, these are some of the best CDs I've listened to in a long time.